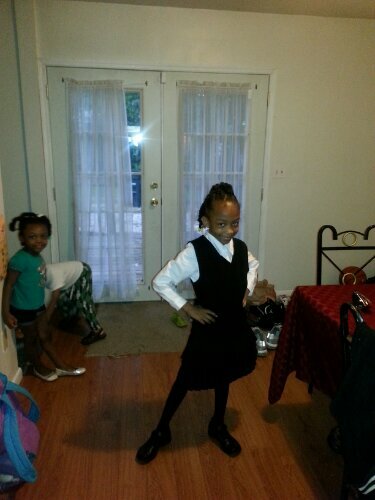 Today is our oldest daughter’s first day of school as a second grader! Our whole family is excited and we were all in the car ready to get her there…and then my car wouldn’t start. I tried several times and then I waited…still nothing. Finally, we all piled into my hubby’s car and got to her school w/less than a minute to spare. I am so thankful that even in the midst of this I am able to hold on to God’s peace. My first reaction could have been to blow a gasket b/c I had just taken my car back to the dealership two weeks ago for this same issue. All I heard my heart saying is “speak the solution and not the problem”. So instead of me calling my sister or a friend to vent or calling the dealership and going all the way offfff, I am choosing to be calm and thank God for everything working out for my good, my car being fixed and running to perfection. I can’t let the little things throw me off and fill me w/negative emotions and words…I’m choosing to believe God and be an example of Him even in the midst of adversity! Have a great week!